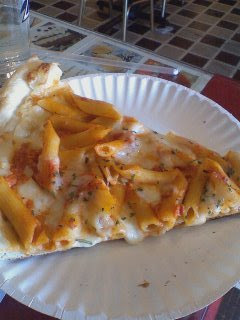 At Tarantellas in Nyack they make amazing penne ala vodka pizza. I used to leave high school and spend the afternoon in Nyack eating pizza and sketching. All these years later they still make it and it's still delicious. Not exactly diet food though. I started doing it my junior year of high school and then much more in my senior, so '92ish. I used to go to Nyack a lot.